The March WER report revisits our October 2016 five year forecast of production floater orders. Some assumptions underlying our forecast have been impacted – positively or negatively -- by developments over the past six months. They include a downturn in expected oil prices, an election in the US that has raised the prospects for accelerated US oil and gas E&D, a continued inability of Petrobras to regain traction following the corruption scandal, a more rapid expected increase in cost of capital and a faster pace of rebound in oil company capital spending. Given the changes, we provide an updated projection of orders over the 2017/21 time period. We also provide a list of more than 70 FPSO/FPU projects likely to move to the contracting stage over the next five years -- segmented into three time periods. 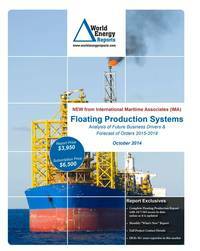 In the data section of the report are details for 199 floater projects in the planning stage, 48 production or storage floaters now on order, 294 floating production units currently in service and 28 production floaters available for redeployment contracts. Charts in the report update the location where floating production and storage systems are being planned, operating, being built and to be installed. Accompanying excel spreadsheets provide the report data in sortable format. Information is current as of 20 March.